The Canon Pixma MG5250 is an amazing device that comes with many useful advanced features and produces great quality photo prints with its Canon Pixma MG5250 ink cartridges. It works best for professional home office users as it takes very less of the space and can fit in anywhere near your PC. Plus, the all in one printer offers features like, scan, copy, built-in Wi-Fi, pop-up LCD display, USB and PictBridge ports, three memory card slots, large paper capacity etc. The smart looking printer weighs 8.1kg and measures 160 x 455 x 368 mm. It has a flatbed scanner and a large LCD display that pops out on the top of the printer. Along with this display screen, there are navigation and function buttons of the control panel. The printer has two paper input trays that offer storage of up to 300 sheets combine. The printer also has extendable hinges on the scanner so that you can print everything from single sheets to books. The printer also offer printing on CD/DVDs and has a separate input tray for that in front. 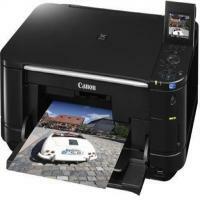 The Canon Pixma MG5250 is good mid-range printer for small home office users. The printer is good for professional quality photo prints and boasts interesting advanced features like built-in Wi-Fi, and CD/DVD prints. The Canon Pixma MG5250 ink cartridges provide high-quality outputs and able to last longer. What to do when prints faint or incorrect colour appears while printing from Canon Pixma MG5250 printer? If print results are blurred or colours are not printed correctly. Then, this may be either a result of old dried out Canon Pixma MG5250 ink cartridges or clogged print head nozzles that need to be cleaned. Follow the procedure below to print the nozzle check pattern, check the print head nozzle condition and then clean the Printhead. Clean the printheads, If there are missing lines or horizontal white streaks in the pattern. After cleaning the Printhead, print and examine the nozzle check pattern again to check the result. If the problem is still not solved after performing the Print Head cleaning twice. Then, one should move ahead for deep cleaning the Printheads. As cleaning the printheads deeply may resolve the issue. When you have performed the procedure until step 3 and the problem has not been resolved, turn off the power and check again by printing after 24 hours. If you still face a problem, then it may be possible that your Canon Pixma MG5250 ink cartridges have drained out or Print Head may be damaged. Contact the canon service centre to fix the issue. Q. Despite its missing features like fax and Ethernet connectivity, why should I prefer Canon Pixma MG5250 for my home office? A. Though there are some missing features in this printer, the printer works best for professional home office users. The printer offers great photo print quality, large paper storage capacity, direct printing from mobile, USB, digital camera and phones and CD/DVD printing. Also, the printer includes features like scan, copy, built-in Wi-Fi, pop-up LCD display etc. Q. How many memory card slots are available for this printer? A. There are three memory card slots available in this printer. Q. Is it possible to print on CD/DVDs using this printer? A. Yes, definitely. The Canon Pixma MG5250 printer has a separate input tray that offers to print on CD/DVDs. Q. Do the Canon Pixma MG5250 ink cartridges you supply, come with a money-back guarantee? A. Though the Canon Pixma MG5250 ink cartridges are supplied after factory-testing and with the assurance of good quality ink cartridges, in case any fault occurs, you can definitely return the ink cartridges and contact us on 048 30833221 or email us on info@printerinkcartridges.ie . We will give you a replacement or refund once the item is reached to us. Q. Which colour Canon Pixma MG5250 ink cartridges do you offer at your site? A. At our site, we offer black, Cyan, Magenta, Yellow and Grey ink cartridges. These ink cartridges are available both in single pack and multi-pack, with ink volume of 13ml. Q. How will I get information related to the latest products or special offers of your site? A. Whenever you login our site for any purchase, we’ll ask you for your personal information so that we can send information related to the special offers and latest products of our site via mail or phone. Q. Are there XL cartridges for the Canon Pixma MG5250 printer? A. Unfortunately, there is only one Canon Pixma MG5250 ink cartridge for each colour. The XL cartridges are not available for this printer. If you are still not clear with this, then you can refer the original site of Canon for more information. Q. How is the serial number of the Canon Pixma MG5250 printer? Where can it be found on the printer? A. The serial number of the Canon Pixma MG5250 printer is 9 character in length and contains four characters and five numbers. The first four letters are the characters followed by five numbers. This is printed on a sticker and can be found on the back side of the printer. Q. Is it important to install the Canon Pixma MG5250 ink cartridges immediately after removing the old ones? A. Yes, it is very important to do so. Please try not to leave the machine without the ink cartridges for a very long time. Q. What should I do when the size of the print data is extremely large? A. In case if your print data is extremely large, you can click Print Options on the Page Setup sheet. Now select the ‘Prevent loss of print data’ check box in the displayed dialog. This will prevent the print data from getting lost. Q. I have two printers. One is Canon Pixma MG5250 and the other one is Canon MG5550 printer. Can I use Canon Pixma MG5250 ink cartridges for both the printers? A. Both the printers use different cartridges. For Canon Pixma MG5250 printer you can use the PGI525 / CLI526 ink cartridges. But for Canon MG5550 printer you need to use PGI 550 / CLI551 ink cartridges. Q. What are the operating system that the Canon Pixma MG5250 printer is compatible with? A. The operating systems that the printer is compatible with are MS Windows XP, MS Windows 7, Apple Mac OS X 10.4.11 - 10.6.x and MS Windows Vista. Q. I want to buy a printer that would last me for 5 to 8 years without having to think of a replacement. Will the Canon Pixma MG5250 printer solve all my printing needs without needing much maintenance? A. Yes, the Canon Pixma MG5250 is a great buy with its mediocre pricing and ability to last longer than the others. It opts for small home and office users. The prints yield great professional quality photo prints and are equipped with advanced features like CD/DVD prints, built-in Wi-Fi. The printer uses Canon Pixma MG5250 ink cartridges which provide high-quality outputs. Q. What are the other features offered by Canon Pixma MG525 printer? The above-mentioned advantages make this printer an impressive buy. Q. Any particular drawbacks worth mentioning? A. The only drawback it has is lack of ethernet connectivity and fax option. Q. What are the cartridge requirements for Canon Pixma MG5250 printer? one can go for the original replacement or buy the compatible Canon Pixma MG5250 ink cartridges at a low price from above on this page. Q. The printing is appearing somewhat faint and incorrect with the Canon Pixma MG5250 printer, what should I do? A. The old and dried out Canon Pixma MG5250 ink cartridges result in blurred and incorrect colours. It could also be due to clogged print head nozzles that require cleaning. Refer to the troubleshooting manual to clean the printheads. Q. The original Canon Pixma MG5250 ink cartridges are way too expensive, and I need to bulk printing every month, can I buy the compatible ones? A. Yes, the compatible ones are cheaper than the original ones but promise the same quality. It is better to go in for the compatible ones after you have finished your originals as you would not make out any difference in the quality and the prices would be much less. You can avail the compatible ones from above on this page with great offers and discounts. Q. What is the printing capacity of the Canon Pixma MG5250 ink cartridges? A. The ink volume of the cartridges are listed below: Pack of 25 Premium Compatible Canon CLI525/PG526 Ink Cartridge Multipack. This massive ink volume eliminates the need to refill or restore the cartridges often. Q. What kind of paper should I use for printing from the Canon Pixma MG5250 ink cartridges? A. All the compatible cartridges easily adapt to the kind of paper needed for printing a document such as A4 sheets, film paper, stickers and many such others. Q. Can I purchase the compatible Canon Pixma MG5250 ink cartridges from your site in a big quantity without worrying about the cartridges drying up? Stocking up on them is easier on my pocket. A. Definitely. It is a good idea to stock up on the compatible Canon Pixma MG5250 ink cartridges in bulk as this would be economical. You can avail great offers and discounts on buying in bulk from our site. Just make sure to keep the seal intact so that the cartridges do not dry up. A. The installing instructions are written in an easy to understand way in the user manual and one can easily install the printer without any outside help. The instructions are also available online on canon’s website.